Q: Media reports say that the fifth China-Japan High-level Economic Dialogue will soon be held. Could you tell us more about this event? Japanese Foreign Minister Taro Kono will lead a delegation to the event. Will he meet with Chinese leaders? A: You may have seen relevant reports. What I can tell you now is that the Chinese and Japanese sides are in close communication with each other on the details regarding the next round of China-Japan High-level Economic Dialogue. I hope to release the official information of this event to you at an early date. Q: Australian media is reporting that Chinese billionaire Huang Xiangmo paid tens of thousands of dollars to get access to Australia's Home Affairs Minister. What is your response to this? A: I have seen relevant reports. You may have already noticed that many questions we responded to in the past few days were based on Australian media reports. When we say that China never interferes in other countries' internal affairs, we mean every word of it. We maintain that when it comes to international affairs, all countries should strictly abide by the purposes and principles of the UN Charter, and we oppose the attempt of any country to interfere in others' internal affairs under whatever pretexts. We have noted that certain Australian media have built up their stories on hearsay or on nothing at all regarding this issue recently. To be frank, we are not interested in putting in so many efforts and resources to comment on each and every one of them. We hope that the relevant media can report on China's policy and China-Australia relations in an objective and unbiased way. We also believe that any responsible Australian citizen, including those in the political sector, can make responsible judgments. Q: The first stage of a railway extension project in southern Sri Lanka was opened to traffic yesterday. It is said to be Sri Lanka's first railway built after its independence in 1948 and was contracted by a Chinese company. Can you confirm that? How can China's practical cooperation with foreign countries bring more benefits to the local people? A: Indeed, the first stage of the railway extension project in southern Sri Lanka is the first railway project undertaken by a Chinese enterprise under the Belt and Road Initiative in the country. And as you said, it is Sri Lanka's first railway built after its independence. It will help provide more convenient transportation in the southern region and give a strong boost to local economic and social development. The people of Sri Lanka are happy with it and we feel happy for them, too. China stands ready to broaden and deepen practical cooperation with Sri Lanka under the Belt and Road Initiative to bring more tangible benefits to the Sri Lankan people. Q: Hong Kong "Occupy Central" organizers were found guilty today on public nuisance charges for the "Occupy Central" movement in 2014. Some foreign critics say it shows Hong Kong's political freedoms are shrinking because the government in Beijing is taking control on the city. Do you have comment on that? A: This verdict rendered in the Hong Kong SAR falls within China's internal affairs in the strict sense. Now that you talked about some foreign comments, I would like to state the official position of the Chinese government. We noted that a ruling has been passed on the case. You may have seen that the 79-day illegal "Occupy Central" movement had a severe impact on the rule of law in the Hong Kong SAR, the prosperity and stability of Hong Kong and people's normal life order there. I believe that in whichever country or region, if such an incident occurs, it is indisputable for the government there to make decisions to uphold people's normal life order. The central government firmly supports the Hong Kong SAR in lawfully punishing the main organizers and plotters of the "Occupy Central" movement. I also want to remind those foreign critics that it makes no sense at all to distort the SAR government's effort to uphold public order and paint it as a harm to Hong Kong's social freedom. Just take a look at the situation in other countries and regions and you will draw a fair and unbiased conclusion. Q: Further to what you said about the Sri Lanka railway, you said it is a project contracted by a Chinese company. Has it also been funded by China? If so, how much? A: As you are referring to specifics about the cooperation project, I will need to get more information. In principle, under the Belt and Road Initiative, the Chinese government encourages companies to pursue cooperation with relevant countries following market principles. Q: US President Donald Trump officially announced in a statement on April 8 that his administration will designate Iran's Islamic Revolutionary Guard Corps (IRGC) a foreign terrorist organization (FTO). It is the first time the US formally designates a country's military force an FTO. Iran's Supreme National Security Council said in a statement that this measure is "a major threat to regional and international stability and peace". As a retaliatory measure, Iran has labeled the US Central Command's forces as a terrorist organization. Do you have any comments? A: We have taken note of relevant reports. 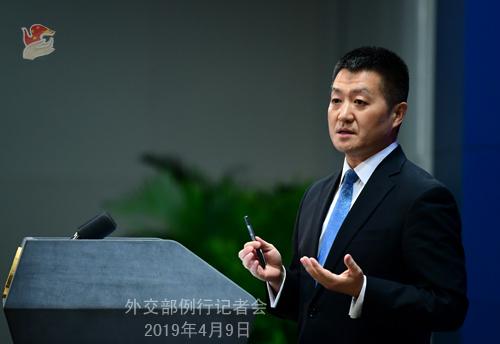 When it comes to state-to-state relations, China always calls for countries to abide by the basic norms governing international relations based on the purposes and principles of the UN Charter and opposes power politics and bullyism. We hope relevant countries, especially non-regional major powers, will do more to contribute to peace and stability in the Middle East and refrain from actions that might lead to further escalation of tensions in the region. Q: The United States says it is going to continue holding a Chinese woman who tried to gain access to Mar-a-Lago for at least a week. I'm wondering if the Chinese government thinks that's justified? A: We have noticed relevant reports. As we said earlier, our consulate-general has made contact with the individual concerned after the incident took place and we will continue to provide necessary consular assistance to her. The Chinese government always requires overseas Chinese citizens to comply with local laws and regulations. 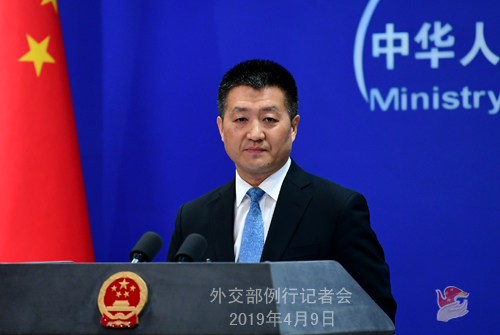 We also expect the US to handle this case in a just and proper manner in accordance with law and see to it that the Chinese citizen's legal rights and interests are guaranteed. 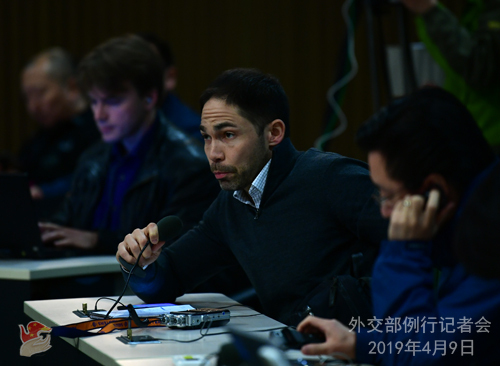 Q: US official Clete Willems said yesterday that the US is not satisfied yet with China's pledges on the trade deal, and that the two sides had agreed to an enforcement structure that will give the US the right to retaliate if China does not live up to its promises. Do you have any comments on his remarks? A: Regarding this round of trade talks that just concluded, both China and the US have already issued readouts. I hope you make an accurate judgment upon them. According to what I have learned, this round of talks did make new, substantive progress and both sides have shown the willingness to conclude the trade talks as soon as possible following the consensus reached by the two heads of state in Argentina on December 1. We hope that the two sides will properly resolve reach other's concerns and reach a result that satisfies both sides on the basis of mutual respect, equality and mutual benefit. We noted that in this process there have been voices of this or that kind emerging in the US from time to time. I would refer you to the competent authority for specifics.